Kilkenny head to Paírc Uí Chaoimh next Saturday evening for the opening round of the Allianz League. The game is part of a double header at the venue, with the footballers of Tipperary and Cork battling it out in the opening game at 5pm. Tickets are available through Centra and Super-Valu stores where early discounts apply, this is also the last week whereby supporters can purchase their season tickets. Final details of the Allianz League Semi-Final between Tipperary and Wexford in Nowlan Park have been announced. The game takes place on Sunday 16th April with a 4pm throw in. The second semi-final between Limerick and Galway has a 2pm start in the Gaelic Grounds. Both games will be covered live by TG4. Kilkenny Supporters are also advised to purchase tickets well in advance as both Ardan de Gras and Ardan Breathnach are likelky to sell out in a matter of days. Please also note that children will require tickets for this fixture. Click on Read More below for important ticket and car parking information. For the second week in a row Kilkenny have just one change in their team for the eagerly awaited Allianz League Quarter-Final v Wexford in Nowlan Park on Sunday. Conor O'Shea, who suffered a hamstring injury in the Dublin game, is replaced by Ollie Walsh. Ollie is named at midfield with Paddy Deegan moving back to the half back line. Click on Read More below for full team. A large crowd is expected on Sunday given the excellent weather forecast and the fact that the game is not being transmitted live on TV. Supporters are encouraged to purchase tickets before Sunday to avail of €5 discount and to avoid queues on Sunday. 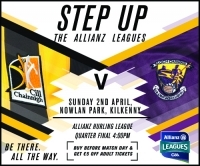 Kilkenny will play Wexford in Nowlan Park next Sunday in the Allianz League Quarter-Final. The game will have a 4pm throw in with the winners playing the winners of the Tipperary v Offaly game in the semi-final two weeks later. There is sure to be a bumper crowd given that Wexford are unbeaten in this year's league and have gained promotion to Division 1A for 2018. Admission to the game will be by ticket only. Tickets are now on sale at the usual Supermarket outlets or on-line from GAA.ie. Adult tickets can be purchased at the discounted price of €15 if purchased before Sunday (€20 on match day). We also encourage students and pensioners to purchase the €15 tickets in advance to avoid queues on Sunday. Underr 16's are free. Click on Read More for full details including parking arrangements. Despite playing with just 14 men for all of the second half Dublin really put it up to Kilkenny in this final round game in Parnell Park on Sunday. It was only in the final 10 minutes that Kilkenny snuffed out the game and pulled away to a 7 point winning margin. The win sees Kilkenny finishing in 4th position and a home quarter-final tie with Division 1B champions Wexford.